Following a moderately successful birding day on the trails at Forsythe National Wildlife Refuge this past weekend, we decided to check out some of the nearby side roads. Most people who visit Brig only go to the main portion where the visitor center and wildlife drive are... and that's fine. We wanted to see a little more. Gotta love a healthy wetlands. Leeds Point Road forks off of Route 9 north of Smithville and leads to other parts of the refuge, including the Scott's Landing Boat Launch. The focus there changes from wildlife viewing to duck hunting, and a rather ingenious Eagle Scout project uses a series of signs that look like birds to illustrate the permitted shooting range. Given that we're well out of hunting season, we could enjoy the sights of healthy spartina waving in the breeze without being concerned with random shots. Binoculars always in hand, Ivan wanted to explore the stand of trees near the parking area, so in we went. We quickly felt enveloped by pitch pines, reminding us that we were, after all, in the outer reaches of the Pinelands. While blotches of sunlight shone down through hurricane-created holes in the canopy, the gnarled trees made the place feel unnatural and weird. I couldn't wait to get out. I really don't like to make generalizations or contribute to shaggy dog stories, but we were in Leeds Point, which added a slightly mysterious undertone to the small forest. Not far from the waters of the Atlantic, the hamlet may or may not be the legendary birthplace of the Jersey Devil. Depending on which source you consult, he might have been born farther inland at Estellville, or perhaps amid a swamp along the Mullica River, which, come to think of it, is pretty much where Leeds Point is. The horned-and-winged one never seemed like much of a Shore guy, though there's a tavern called JD's in Smithville that serves a very tasty Jersey Devil burger. Well, gee. We didn't know whether to be amused or concerned: amused for the obvious reason, concerned that we might not be welcome visitors, no matter our innocent intent. Were the locals fed up with rowdy explorers looking to raise the devil? Or were they pranking their neighbors on the next road? If they truly had negative intent, it's not likely someone would have put so much effort into an artistically-rendered three-dimensional sign. Instead, they'd have just spraypainted "Get out!" on a plank of plywood and nailed it haphazardly to a tree. We continued driving down the road, next coming upon a creatively-executed sign advising motorists to watch for and respect motorcycle riders. Fair enough. Bikers would have enough of a challenge with the road, given the uneven, pockmarked macadam. What we found at the end of the road was a mix of weatherbeaten Down Jersey fishing shacks and small bungalows that weren't quite as worn. Folks may live in one or two of them, but for the most part they look like shelters for weekenders who want to get a few hours sleep before jumping in their outboard-powered rowboats in the predawn hours. All they really need is space for a couple of air mattresses, indoor plumbing and a fridge for bait and beer. Next to what looked like an old boat yard was the Oyster Creek Inn, which had attracted a sizable holiday weekend crowd. I could have sworn I'd found this place once on my own, during the depths of winter, but it was a lot livelier on a sunny spring weekend. The marsh, just north of the tract we'd seen at Scott's Landing, looked fresh and healthy. If the Jersey Devil had been born here, he'd be hard pressed to be evil. That is, until the greenheads come out in the humid languor of July. Pick any four-year college in New Jersey, and it's likely you'll find a bunch of old houses on campus, renovated for educational purposes. Some are grand, like the Guggenheim mansion that now serves as the Monmouth University Library. Others are are more modest Victorians or Colonials converted to office space as the school grew around them. 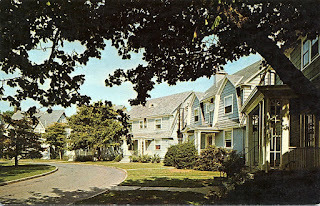 When New Jersey College for Women was founded in 1918, resident students lived in the large house on George Street which is now known as College Hall. Dean Mabel Smith Douglass knew that the school would grow, so she and the board started exploring housing options for the anticipated student body. However, the search for funding to build dormitories was difficult. No lending institution would extend credit to a women's college, fearing that the school would fail to attract students and would be forced to close before paying its debts. One bank, however, agreed to an innovative solution: build housing that litterally was houses. By constructing what was essentially a subdivision, NJC would gain a substantial number of dormitory rooms for its students. If the school defaulted on the loan, the bank would have a much easier time unloading individual houses than it would face in selling a large building. A few of the Corwin houses on the second horseshoe. Two residential campuses were built, both a fair distance from the college's academic buildings on George Street. Each of the campuses - now known as Gibbons and Corwin - is comprised of several houses containing at least nine bedrooms, plus a kitchenette, living room and basement study rooms. A central lodge on each campus acted as a meeting place and communal lounge. Corwin houses were built on two semi-circular roads, with larger 40-woman houses at each end of the two "horseshoes." True to the plan, each of the houses could easily be sold to private owners as cozy one-family homes, should the bank need to take possession. Each of the nine-bedroom houses had virtually identical floor plans, but the exteriors came in several varieties, just enough to add a little individuality for a potential buyer. Renamed Douglass College in 1955, the school continued to grow and prosper, prompting the construction of more traditional dorm housing closer to the central campus. Expansion also meant that additional academic buildings were built closer to the Gibbons campus, making that housing more desirable. Corwin, on the other hand, was separated from the rest of Douglass by several Cook College buildings. While generally considered 'last resort' housing, those relegated to living in Corwin were fiercely loyal to their homes on the horseshoes. The coziness of the houses, plus the familiarity that comes from living in close quarters with 16 other students, engendered a unique kind of camaraderie among housemates. Though the Gibbons houses are still in use as housing, Corwin stands largely vacant. A handful of the houses have served as offices for various university departments, but for the most part, the campus looks like a dated subdivision awaiting its first families to move in. Given the costs of retrofitting more than 20 houses with fire suppression systems and internet access, and the university's zeal in building new housing, it's not likely that Corwin will ever serve as dorm space again. Every year on the third Saturday in May, thoroughbred horse racing fans watch the Preakness, the second leg of the famed Triple Crown. That's not to be confused with Preakness, the section of Wayne, but perhaps it should be. 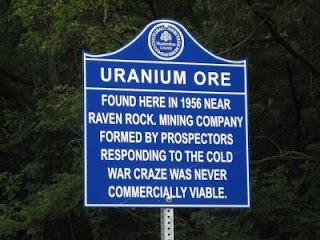 Wayne is well known for mall shopping and sprawling suburbia, and the casual visitor would be excused for thinking that maybe some mid-20th century developer had borrowed the race name to give the area some cachet. You know, "Racetrack Estates at Preakness," or some nonsense like that. I have to admit I figured as much the first time I drove through and saw so many businesses using the label. It took some research to discover that the name, indeed, predates the both the race and European settlement in the area. Preakness Stables was established in 1865 by Massachusetts businessman Milton Sandford, who'd made a fortune as a defense contractor during the Civil War. Like many well-heeled gentlemen, he used his riches to join the racing set, purchasing substantial acreage at what's now the corner of Valley Road and Preakness Avenue. Convenient to his New York offices and a recently built racetrack in Paterson, the land soon was the home of stables, a blacksmith shop and a three-quarter mile track. Sandford borrowed the Lenape name for the community, which has alternately been stated as "Proquales" (quail woods) or "Parekuis" (young buck), depending on the source. 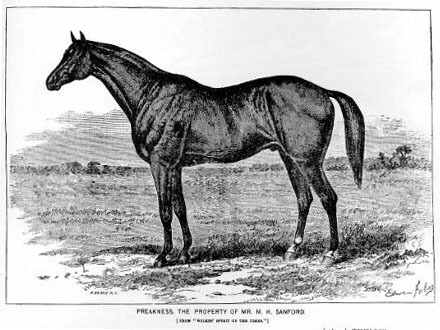 Sandford also called one of his thoroughbreds Preakness, though the horse had been born elsewhere. Perhaps he was looking to build awareness of his new venture; if so his strategy was a good one. The four-legged Preakness made a stunning debut, winning the inaugural run of the Dinner Party Stakes at Pimlico in 1870. Now known as the Dixie Stakes, the race was, at the time, among the richest events of its kind in horse racing. Preakness went on to an impressive career, racing until the age of eight. To honor the winner of its first race, the Pimlico track inaugurated the Preakness Stakes, with the first running in 1873. Interestingly, if you check out the race website, you'll find plenty of history about Pimlico, but nothing about the origin of the race name. If you happen to watch the race this Saturday, let me know if there's any mention. Oh, and according to Wayne historians, all those sportscasters have been pronouncing the name wrong. Rather than "preek-ness," it's "preak-ness," with the first syllable rhyming with "brake." Even when you think you have a pretty good idea of what a site holds, it's always worth checking out a stray trail or two. Recently I discovered a narrow, unblazed footpath along Watchung Reservation's Surprise Lake and found my way to a whole new habitat I'd never known to be accessible. Ivan and I explored a bit farther a few days later, eventually finding the lake's marshy conclusion, hard by a sound barrier separating it from the roar of Route 78 traffic. I'd always figured that the waterway had to end somewhere; I'd just never bothered to try to get there. It's really quite a beautiful place, if you can ignore the constant hum of interstate traffic. Choked with lilypads and wetlands grasses, the marsh is home to a number of aquatic birds, including two of my personal favorites: wood ducks and green herons. They're both fairly shy species, and our arrival caused a few to wing off to other hiding spots somewhere on the lake, but others simply swam to more secluded areas where we couldn't track them. From a wildlife viewing perspective, the place couldn't be more accommodating. Earthen berms cross the lake at two locations, allowing people (and horses in one area) to get a sense of the full length of the lake by basically standing on it. The first time around, we crossed the farthest berm out and returned to our starting point via another narrow path. It brought us up an embankment nestled against the sound barrier, the trail wandering a hundred feet or so away from but parallel to the lake's edge. Eventually we made it back to the point where I'd concluded my original exploration, and we returned to the car via the bridle path. On our second visit this past Sunday, we discovered that the recent rains had created a stream across the start of the footpath, so we had to start our journey on the bridle path. Getting out to the berms was easy enough, and we crossed back to continue the trip. This is where we got a bit tripped up. Instead of taking the lower path that would have had us retracing our steps from the last time, we took the upper path that led uphill and closer to the sound barrier. Thing was, we didn't realize it until we were well down the path. Route 78 overpass: a deer's eye view. Something seemed a bit off. First, there was a steady stream of water coursing down the path. It wasn't troublesome, but it seemed like storm sewer water looking for level ground. The last time we were there, it hadn't rained for several days, so that wasn't a clear sign we were on the wrong path. Second, this route seemed noisier. I remembered hearing the dull roar of Route 78 traffic before, but I didn't recall it being so close. And third, the farther we got along the path, the more different the foliage was. Rather than a lot of underbrush, we had a pretty clear path through a tunnel of honeysuckle. It smelled wonderful, but still, it was a little offputting. The noise issue seemed weird but only got stranger when I sensed the hum of traffic below us. Could we be on the famous Watchung Reservation bunny bridge? If you're familiar with Route 78, you know that a series of bridges pass over the road in the Mountainside area. The easternmost carries Glenside Avenue across the highway, the westernmost holds an abandoned road that once led to a Nike base, and the one between them is covered with plants and trees. That wooded one is the bunny bridge, or wildlife overpass. Why build a bridge for mammals and reptiles? The short answer is compromise. Originally, Interstate 78 was slated to run directly through Watchung Reservation, the largest plot of preserved land in Union County. Environmentalists and local residents held up construction for years, seeking an alternate route or perhaps to stop the road altogether. Meanwhile, the Federal government continued building and opening other segments of the highway, forcing travelers to find another route through the Mountainside/Summit/Springfield area. To get the road built, government officials agreed to move the road to the edge of the Reservation and excavate a right-of-way into the Second Watchung ridge to lessen the sound impact. They also built a bridge from the main part of the Reservation to the thin sliver remaining on the westbound side of the highway, allowing wildlife to move easily between the two areas. With those elements in place, the road opened in 1986. Depending on who you talk to, the bunny bridge has been either accepted or shunned by animals. Coincidentally, I'd recently gotten an e-mail from Hidden New Jersey reader Darian Worden, relating his own adventure on the bunny bridge. I thought we might be following his footsteps when we heard the humming traffic, but we weren't. A paved road and chain link fence joined us as we walked, raising a new discovery. I hadn't realized it, but the Glenside Avenue overpass also carries its own lane of vegetation and, presumably, the occasional mammal. We kept walking and eventually came to an athletic field where a girls' soccer league game was taking place. It was kind of like being in Field of Dreams, but without the baseball bats. We hadn't found the bunny bridge, but something even odder (at least I think so). A view of the map shows that our path leads to additional county open space, but I'm not sure that deer are welcome there any more than they are throughout suburban New Jersey. I guess if you want to walk across Route 78 in relative safety, it's a place to do it, but you'd have to go through a bit of trouble - and mud - to do it. Drive eastbound on the Turnpike's Newark Bay extension, and as you approach Exit 14B for Liberty State Park, you might notice the road widens somewhat briefly on both sides. It's almost as if the road's a big snake that's swallowed a mouse but hasn't yet digested it. In recent years, the widenings have been filled with construction equipment and materials for the construction work being done on the Vincent Casciano Bridge over Newark Bay. Every time I pass them, I get this nagging feeling that the spots were once small service areas many, many years ago. Details are rather scant, but it seems that the pair were named for John Stevens (eastbound) and Peter Stuyvesant (westbound), two personalities with connections to the Hudson County area. Stevens, of course, is the name of a notable early New Jersey family with roots in Perth Amboy. The first famous John Stevens was born in 1715 and served in the Continental Congress. His son John was as an officer in the Continental Army and later did duty as state treasurer. 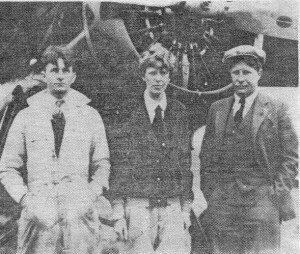 The younger man's greater fame, however, came through his contributions to transportation, particularly using steam power. His craft Phoenix became the first steamship to sail the open ocean when it traveled from Hoboken to Philadelphia in 1809. More famously, he established the first steam ferry service between Hoboken and New York City in 1811. A few years later, Stevens and several partners were awarded the nation's first railroad charter, establishing the New Jersey Railroad. Predictably, he experimented with steam-driven trains at his Castle Point estate in Hoboken. After his death, the property passed to his son Edwin, who later bequeathed the land and a million dollars for establishment of an institution of learning, now Stevens Institute of Technology. Peter Stuyvesant, well, he's probably a bit better known, but more commonly associated with New York. In the days when the Dutch West Indies Company ran Manhattan and surrounding areas as a business, Stuyvesant was sent to essentially clean house as director general of New Netherlands. His immediate predecessors had both mismanaged the colony and turned a blind eye toward some rather, well, permissive behavior. Stuyvesant's tenure was a mixed bag. On the positive side, he negotiated disputes with the Lenape, fostered education and is credited with many reforms that encouraged a more family-oriented environment in the colony. Unfortunately, he also squelched religious freedom in a community that had long advocated tolerance; his actions against houses of worship other than the Dutch Reformed Church were ultimately rescinded by Dutch West Indies Company directors. I was a bit confused as to why he warranted a Turnpike service area, until I read that he opened the land west of Manhattan for settlement. Some consider him to be a founder of Jersey City, crediting him with overseeing the formation of the village of Bergen, now the location of the city's Bergen Square. Back on the Turnpike, the Stevens and Stuyvesant service areas were closed in the early 1970s. I haven't uncovered a reason why, but I'd conjecture that they were either too small or too disruptive to the flow of traffic rushing toward or from the Holland Tunnel. Drivers can get their last (or first) taste of lower-priced New Jersey gasoline closer to the Tunnel, so perhaps the Turnpike options were priced out of existence in during the oil crisis of 1973. Your guess is as good as mine. It seems a little weird to compare the reopening of Sandy Hook to Christmas, but in my case, it works. It's long been the place where I can go to get some peace, and it's one of the spots on Earth that just make me feel good without even trying. Even in the dead of winter, I can usually find a good adventure or, with Ivan, an interesting feathered visitor. Anyway, May 1 has been on my calendar as the official reopening date for the Hook post-Hurricane Sandy, and I couldn't wait. I woke up sometime around 4:30 a.m. and couldn't get back to sleep, so I opted to make an early start. Sunrise was at 5:55, giving me plenty of time do all my morning stuff and hit the highway by daybreak. The Park Service has done a great job of setting expectations on restoration through their Facebook page, but I didn't know what to expect in terms of visitation. Weather already looked wonderful, making it as good a day as any to play hooky from work, at least for the morning. Would there be a crowd? When it came to birds, it was anyone's guess. Since nobody's been birding there all spring (or just hasn't reported, if some lucky duck got access), it's hard to know whether the storm's impact has changed the place enough to make it unattractive to some species and more attractive to others. Whatever the case, I was eager to get there and find out for myself. As I took the Route 36 bridge over the Navesink River, I couldn't help but let out a whoop of happiness. I can recall having that kind of happiness entering the park on a beautiful summer morning, or at any other time of the year when I needed to recharge my batteries with a day on the Hook. I didn't realize how much I missed it, though, until I drove through the entrance plaza and my eyes teared up. Roads are still rough in places (they've been milled and some are yet to be repaved), but knowing they'd been covered with sand, I was happy they were entirely passable. And it seemed that I'd gotten there before just about everyone but the fishermen. Battery Peck hasn't looked this good in a long time. My plan was to make my way to the warbler trail next to Battery Peck and Nine Gun near the tip of the Hook, and then check out some other birding spots along with Fort Hancock. Given the time of year, it seemed like the best approach. Except that it wasn't. I neither saw nor heard a single warbler in the tight foliage along the path, though plenty of red-winged blackbirds and robins were around. Perhaps, I thought, the warblers were waiting for their breakfast bugs to warm up in the early morning sun. Either that, or they'd already come and gone. The worst of the damaged porches on Officers Row. On the way to my next stop, the scout camping grounds, I wound my way around Fort Hancock. I happily found a pair of osprey making a cozy home atop the Officers' Club chimney, and several others on the wing. The park's closure meant I couldn't make my usual mid-March visit to check on their annual return, and I was glad to see so many nesting around the Hook. Maybe they weren't as plentiful as blackbirds, but for a few minutes they certainly seemed to be. Overall, as I drove around, I saw that many of the buildings had taken at least a small hit from the storm, from busted windows to missing roof shingles. Probably the worst I saw was the old mule barns near the Coast Guard base, which were accessible only by boat for a few weeks after the storm. Most of the Officers' Row houses now suffer the indignity of propped-up porch roofs and missing front and/or back steps, though it also appears that the stabilization boarding over the windows is new. The brick work all seems to have held up: those structures were built to last. There's nothing like new barbecue equipment! The scout camp, when I got there, was a tiny bit more productive from a birding perspective. In fact, it was tea time according to the most prevalent song birds there. The call of the normally delightful Eastern towhee has been described as "drink your teaaaaaa," but most of these guys simply sang the last two notes. They had me hunting for a bit, until one handsome fella perched atop a shrub, singing for all to see in the bright morning light. He was just the first of many who made themselves visible on my rounds. Perhaps a flight had come in overnight, or maybe procurement sent the Park Service towhees instead of warblers, but I hadn't seen so many in one place ever. were removed by the hurricane. Still, though, I was a bit frustrated by the seeming lack of avian diversity, and as I ran into other birders, they admitted being just as disappointed. Walking the multi-use path will often reveal a wide range of birds, but the only ones who'd show themselves were annoyed house wrens and a pair of house finches. The lighting, however, was fantastic, illuminating the iridescence of a grackle as I'd never seen before. Absolutely gorgeous! I also walked the maintenance road and bayside beach near Batteries Kingman and Mills, finding more towhees in the brush and a gathering of late-staying brant and a merganser in the water. Without realizing it, I antagonized a pair of osprey nesting on the land side of Kingman, an area I hadn't known was equipped with a platform for them. They seemed to be doing much better than the less-than-wise pair who were building a nest on a utility pole next to the road. It'll probably take some time to determine the impact the hurricane has had on the flora and, by extension, the birds' feeding opportunities on the Hook. As I was reminded by one of the friendly NPS maintenance people I ran into, the peninsula had been hit with 13 foot storm surges, and the resulting flooding had to have made its mark. For the time being, there are still repairs to be made. Superficially, there's road repaving and reconstruction of wooden walkways, most remarkably the boardwalk and observation deck at Spermaceti Cove, now totally gone. Long term, the park still needs major infrastructure improvements, including the sanitary sewer system. If you're planning a trip there, consider stopping by the Wawa or Quick Chek on 36 as you approach the park. The porta-johns were very clean when I checked, but, well, why go rustic if you don't have to? In any case, it's a small inconvenience when compared to the joy of being back on the Hook.